A strategic turning point for BigMat International! HomeBigMat►2016►A strategic turning point for BigMat International! 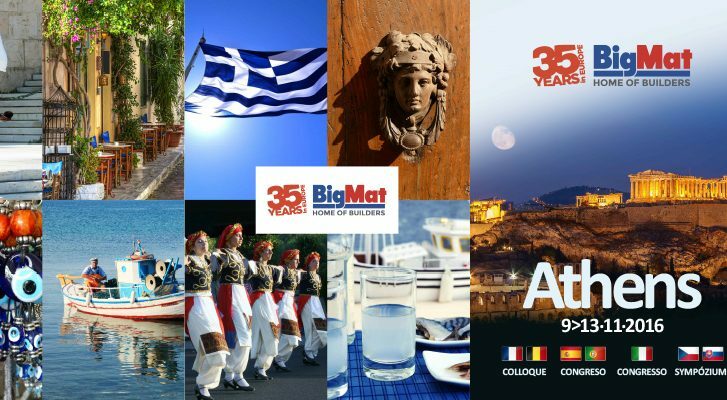 BigMat International, the leading international chain of independent traders in construction materials, celebrated its 35 years of existence this year between November 9th and 13th, 2016, in Athens. An anniversary and a symbolic turning point for the group which gathered under the banner of a founding theme in line with the current situation of the European construction market: at the crossroads between tradition and innovation. Among the major challenges and issues of this 2016 edition bringing together the members of the network: What changes need to be implemented in order to exist at a time when the market is getting tighter and tighter and the competition in the sector fiercer and fiercer? And how can we remain the “preferred” dealer for our clients? Under the guidance and pacing of Charlotte Savreux, a French journalist and MC of the Congress, the guest speakers Olivier Dauvers, an international expert from the world of consumer affairs, and Javier Panzano, the CEO of the Euronics chain, a European group specializing in the sale of electronic products whose members are independent merchants, and for whom cohesion and respect for the international strategic plan are the fundamental lessons learnt, provided added value to accompany the dynamic of the group sessions and to optimize the potential of the BigMat chain. A sharing of experience and expertise that formed part of the extension of the strategic plans shared with the delegates by each of the of the BigMat countries, with the advantage of stirring up a debate about the changes to be encouraged. Among the ambitious projects under way: the deployment of Cocoon in Portugal and in Spain, then the support of studies carried out in France in connection with the local reference market to optimize a sales outlet’s performance, or, finally, the digital communication dynamic provided by BigMat Belgium. This 2016 edition will be remembered for its great sharing opportunities enabling each member to be inspired by the audacious changes undertaken by their European counterparts, while preserving the pioneering values and the capacity we all have to reinvent ourselves that have enabled BigMat to remain in the forefront and to maintain an honourable position on the market. A wind of change is blowing through the BigMat chain, the start of a new era, between tradition and progression, in order to succeed better with the challenges we all face tomorrow.